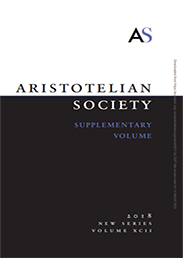 The Aristotelian Society Supplementary Volume is a commission-only journal and is published annually in June. It contains the Symposia to be read at the Annual Joint Session of the Aristotelian Society and the Mind Association. Arrogant people are often intolerant of questioning or criticism. They respond to genuine and even polite challenges with anger. They are bullies that attempt to humiliate and intimidate those who do not agree with, or explicitly defer to, their opinions. The arrogant feel superior to other people and arrogate for themselves special privileges. This sense of entitlement and desire to keep others’ down explains the anger, intolerance of criticism, and the bullying behaviour that is characteristic of those who are arrogant. Ordinarily, when speakers put forward in conversation a claim as true they acquire responsibilities to their audience, and are entitled to expect respectful treatment in return. Speakers owe to their audiences that they are sincere, that they have good reasons to believe that what they are saying is true, and that they are prepared to defend their views against legitimate challenges. The arrogant behave as if no challenges to their views were ever legitimate. That is, they behave as if their claims had the special authoritativeness of verdicts. There are circumstances in which some people are called to issue verdicts. These are cases where people, by virtue of their roles as jurors or referees, have the unique authority to make claims that are based on the facts of the matter, but that are not open to debate by other members of the community. There are generally procedures for challenging verdicts but verdicts are unlike ordinary claims. Only special authorities have the power to issue them. Arrogant people think of themselves as special authorities in virtue of their alleged superiority. This is why they treat questioning as illegitimate. They also think of criticism as insulting because it indicates a failure to acknowledge their alleged authoritativeness. Hence, they respond to it angrily. Anger is a negative emotion directed at someone who is perceived as intentionally harming or slighting one or what one holds dear. It is also accompanied by a desire to retaliate or get even. Arrogant people perceive criticism as insulting, since it is tantamount to treating the arrogant person as an ordinary person. Arrogant people think that they are not ordinary. They believe that they are superior and they demand to be treated as such. Intimidation and humiliation are among the ways in which arrogant people retaliate in anger. These behaviours are designed to lower the status of others. They, thus, are particularly effective means of preserving arrogant people’s superior rank in the community. Those who are on the receiving end of acts of intimidation often respond by self-silencing to avoid future unpleasant experiences. They might become timid and lack the courage to challenge those who arrogantly try to defend a pre-eminent status. Humiliation has similar effects. Those who are often publicly humiliated rarely can find the courage to resist. Often instead, they respond in shame to public dressing downs. Being on the receiving end of such treatment frequently results in a damaging lowering of self-esteem. Hence, intimidation and humiliation are especially effective tactics adopted by those who wish to excel by keeping others down. But why are arrogant people so keen to diminish others? Why are they so angry? The answer, as Aristotle noted in the Rhetoric 1379a 49- 1379b 2 , lies in their insecurity. It is precisely because deep down those who are arrogant know that they are not superior or uniquely authoritative that they feel the need aggressively to defend their fragile status by bullying other people. Hence, the arrogant are often engaged in elaborate rationalisations. They constantly need to feed their egos, in order to suppress the suspicion that they might not be that special after all. Featured image credit: “Light Photo” by Jussara Romão. CC0 via Unsplash. Alessandra Tanesini is a Professor in Philosophy at Cardiff University. Her current work lies at the intersection of ethics, the philosophy of language, and epistemology and focuses on epistemic vice, silencing, prejudice and ignorance. Her article, “‘Calm Down, Dear’: Intellectual Arrogance, Silencing and Ignorance" was included in the Oxford Think Festival collection. Thank you for this piece. If it is acceptable to you, please may I refer others to it. It seems to me to be the very definition of why arrogance returns anger for queries.